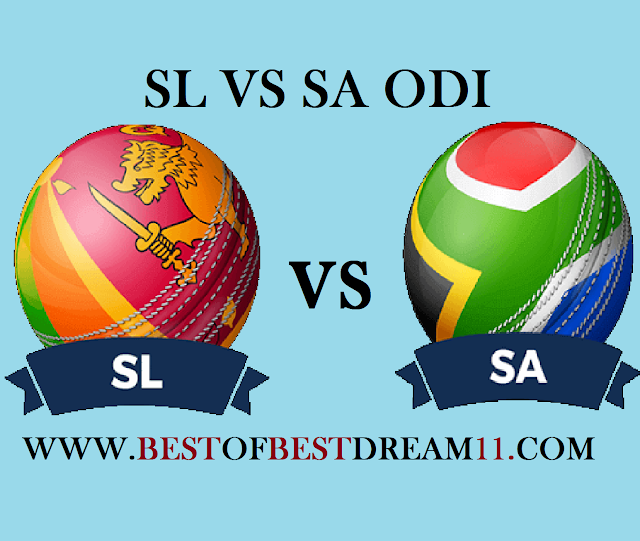 Here is best "SRI LANKA VS SOUTH AFRICA" , 4th ODI match,(South Africa tour of Srilanka ), DREAM11 Predictions for the Fantasy user ,who venue are looking to make a strong team for maximum win. We are providing latest news, match update, information about the match .The team is picked by using various factors on the basis of performance, ground stats and latest form. In the five-match one-day series, South Africa won the initial 3 matches and took 3-0 lead in the series. Sri Lanka's position is very bad against South Africa, they have lost 11 matches in the last 11 matches. South Africa will try to clean sweep against Sri Lanka after winning the remaining two matches. The pitch of Dambulla have seemingly become more batting friendly .Chasing teams also appear to have done well. 1- for South Africa, Reeza Hendricks played his first match of the series in the last ODI and scored a magnificent century (102runs). 2-H.Amla(59runs),JP Duminy (92runs) ,D Miller(51runs) played brilliant innings in the last match. 3- in bowling, Lung Nigidi(8wkt from 3matches),Kagiso Rabada(5wkt from 3 matches) ,A Phehlukwayo (6wicket) have been doing the well with the ball. 4-for Srilanka, De Silva (84),Mathews(32),Kunal mendis(31),Kusal Parera (27) played good inning in the last match. 5- in bowling, Parera (4wkt),Dhananjaya (1wkt) and L Kumara (2wkt) will be crucial for team. 1- Faf du Plesis has been ruled out of the toor due to a injury in the last ODI.